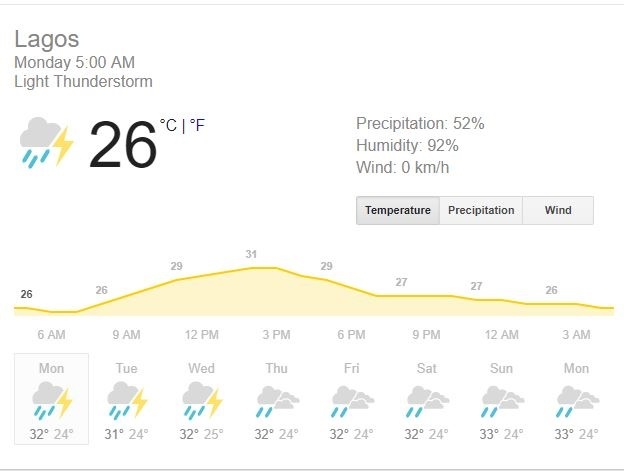 Lagos: Temperature, 26°C - 31°C with 72% chance of rain. Abuja: Temperature, 22°C - 33°C with 32% chance of rain. Port Harcourt: Temperature, 18°C - 23°C with 62% chance of rain. Enugu: Temperature, 23°C - 32°C with 43% chance of rain. Kano: Temperature, 16°C - 36°C with 0% chance of rain. Make sure you hold your umbrella. Riddle Me This - There is a word and six letters it contains. Take one away and twelve is what remains. What word is it? The word is dozens. Take away the “s” and it becomes dozen.